The South Okanagan was built for Cycling. The South Okanagan was designed by God as a mecca for road bikes. It offers everything you could possible ask for: challenging climbs, interesting rollers, thrilling descents and long, scenic cruises. No wonder it's become home (or home away from home) for some of Canada's top cyclists. From Penticton, incredible cycling stretches in every direction - and we've hand picked our favourite routes to share with you! It's a long climb but you still can chat! This ride is consistently cited as a guest favorite. From Penticton, you have a long but relatively gently climb (about 560 meters of elevation over 18 kilometers) through the cool forests of Green Mountain to the Apex turn off. Here, if you really want a challenge, you can ride the 800 additional meters of elevation to the Apex Alpine Village, with grades pushing 15%. That's about 30 kilometers of full out climbing (putting it in the same class at the famous Stelvio pass in Italy and making it tougher than the Alpe d'Huez in the Tour d'France)! Of course, most guests chose the more gentle option of skipping this additional torture and continuing down the back side of the mountain to White Lake, then continuing through Okanagan Falls and back along Skaha Lake to Penticton. We can modify the distance of the route based on the degree of challenge your group wants. Shuttle Transfer available from Kelowna. Just ask us! Every single kilometer of this ride offers jaw-dropping scenery. Naramata is perhaps the most picturesque wine region in the world. We ride along the bench past dozens of wineries and acre after acre of vineyard stretching along the bluffs towering over Lake Okanagan. Again, there are lots of options on this route so we can crank up or tone down the degree of challenge depending on the wishes of the group. The more adventurous can add an optional descent down to Indian Rock and the subsequent climb back up the bench. We can also add a challenging 500 m climb up Carmi road on the east side of Penticton. This route explores the South Okanagan where the Valley opens up to accommodate the best vineyards in Canada. 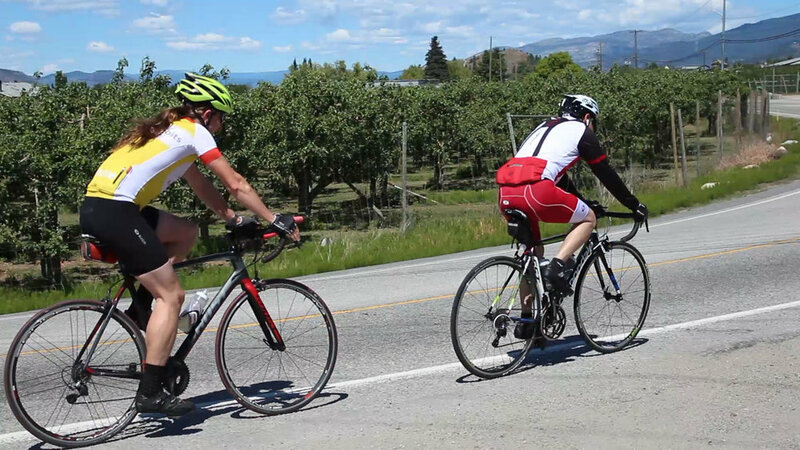 You'll ride past Skaha and Vaseux Lake to the stretch of wineries known as the Golden Mile. Here, it's a scenic cruise down Tuc El Nuit and Black Sage Road through Oliver towards Osoyoos. Then, we start heading north again and climb up into the Okanagan highlands past White Lake and back down to Kaleden. Like our all road routes, we can modify this route to match your groups preferences.